The 61 species of pine trees that grow throughout North America fall under the categories of soft pines and hard pines based on such characteristics as their wood and their needles. Pines grow in acidic soil and are often among the first tree to reforest an area after a fire. The pines are evergreen, retaining their needles through the cold, and the trees produce woody cones that harbor their seeds. The pine trees are some of the tallest trees in their ecosystems. The Eastern white pine and the red pine of the American East both can attain heights of 100 feet, and the slash pine of the Deep South is another species that can grow to that height. The pines that grow in the West can grow much taller, with some like the sugar pine known to approach 200 feet high and the Ponderosa pine able to make it around 180 feet. Not all pines are giants, with species such as limber pine and bristlecone pine rarely taller then 40 to 50 feet. To identify pines it is important to examine such facets of the tree as its needles, cones and bark. For example, upon scrutiny, you would find that the Western yellow pine has needles that are 8 to 10 inches long and they exist in bundles of threes on the branches. The needles are light green with barely detectable serrations on their edges. The cones typically grow in pairs, are light brown and up to 4 inches long. The thick bark is a brown-black when the tree is mature, possesses a vanilla aroma when you peel it away and is full of furrows. Look at the range maps of pines and you will discover that many types of pine trees have a large geographic distribution. These include species such as Ponderosa pine, jack pine, lodgepole pine, shortleaf pine and loblolly pine. Other pines grow in much smaller areas, with some like the foxtail pine and the bishop pine found only in specific parts of the West. Ponderosa pine has the largest range of an American pine, extending from Canada southward well into Mexico and covering vast parts of the western states. Pine trees are a very important genus of trees in terms of their uses. Lumber and pulpwood are vital pine products, and pines are instrumental as telephone poles and in furniture. You may opt to plant pines on your property as windbreaks, specimen trees or as a tree to form a buffer between your property and a busy roadway. Pine trees are popular Christmas trees in many parts of the country, with the Virginia pine, Eastern white pine and Scotch pine all possessing traits that make them usable for this purpose. 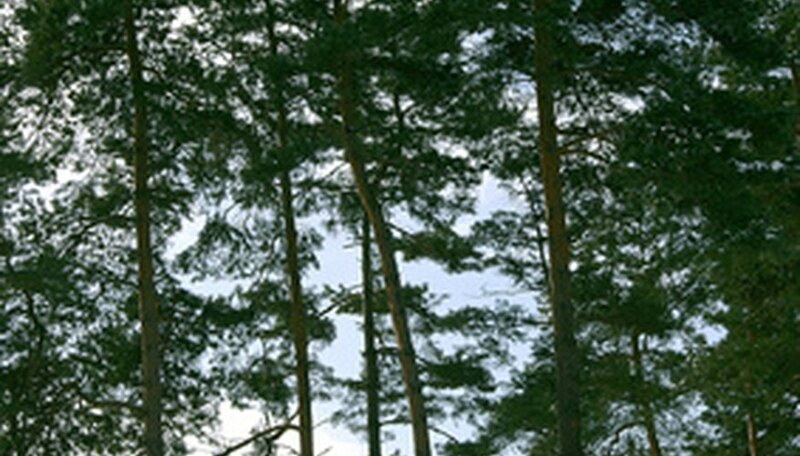 Cultivars of various pine trees are available for your landscaping needs. The Eastern white pine alone has many hybrids, including those like the UConn and the Contorta that grow much smaller than a typical Eastern white pine and make sense for smaller scenarios. The Don Smith cultivar of the red pine features the species trademark red-brown bark as well as long green needles. Yellow needles separate Wate’s Golden pine from the Virginia pines that grow in the wild. What Is the Difference Between Yellow Pines and Lodgepole Pines?